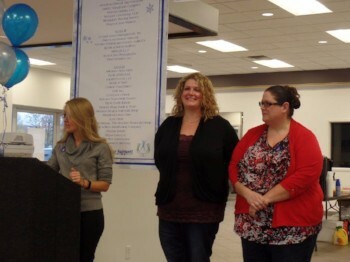 Every November, we recognize just some of the wonderful people and groups that support the people at DSC. Today, we are meeting our 2017 Employer of the Year! We are excited to present this year’s award to Dish Passionate Cuisine. At DSC, we are very fortunate to be surrounded by a strong and vibrant community of employers. Our business community is among the best in their willingness to embrace diversity and recognize opportunities that allow all people to become contributing members of their world through finding employment. This year, we are recognizing one of those companies who have made outstanding efforts to help create success for their business, but as importantly have become invested in the long-term careers of those they hire. Colleen and her sister, Liz, co-own Dish Passionate Cuisine. Their company’s roots began as Chef Benjamin & Company in 2008 when Colleen was working there. In 2011, an opportunity to purchase the business surfaced, and these two women took that leap of faith and purchased it. Soon after, Colleen, along with her sister, renamed the company Dish Passionate Cuisine. Currently, Colleen and Liz have two individuals who are working with them, hired from DSC, but the most impressive part is the longevity of these two individuals at Dish. One has been working with Colleen and Liz for six years and the other for two years. Colleen and Liz’s dedication to their employees is amazing…their caring is not limited to work hours or typical work environments. One of the people working with them has some significant hearing loss and communication challenges. Colleen and Liz simply adapted their internal communications to accommodate his needs and ensured his opportunity for success. Colleen and Liz…thank you for creating such wonderful experiences for your customers, your community, and your staff. Congratulations! !